First round of the British F3 series kicked off at Oulton Park at the weekend, with Lanans Toby Sowery and Aaro Di Comberti competing in the first round, at the amazing Cheshire circuit. 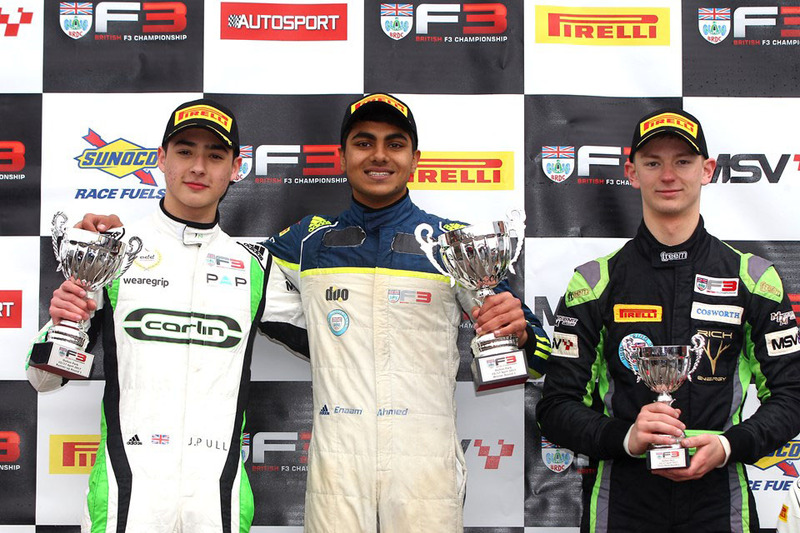 Late race pressure paid dividends for Carlin's Enaam Ahmed as he forced long-time leader Toby Sowery into a mistake at Cascades to give him victory in the opening race of the 2017 BRDC British Formula 3 season at Oulton Park. Sowery's error saw him skate through the gravel and drop to third, with James Pull following his team-mate Ahmed through into second. After the race, we spoke to all three of the drivers to get their thoughts on the race and opinions as they look forward to race two of the day in Cheshire. "I'm pretty disappointed to be honest. We were leading throughout the race but I made a mistake and I lost out because of that, letting both Enaam and James through. I'm pretty disappointed. I probably didn't have the pace to hold him off as he was badgering me throughout the whole race and at the end I think he would have been able to get past. It is something we are going to work on for the next race. We shall see what we can do in race two. Last year we were really good in reverse-grid races so hopefully we can get another podium at least." Lanans 13 car of Aaron Di Comberti recieved a 10 second penalty for being out of position at the start, which unfortunetly saw him drop to P18. Enaam Ahmed took advantage of a hectic second race at Oulton Park to add to his race one British F3 win earlier in the day, charging from eighth to first to claim victory. An opening lap accident forced a red flagged and, with a number of cars eliminated and unable to take the restart, Fortec Motorsportsâ€™ Ben Hingeley took second ahead of Callan O'Keeffe in third. After finishing eighth in race one, Chris Dittmann Racing's Omar Ismail lined up on pole position for the partially reversed grid race two and as the lights went out, he led the field into Old Hall Corner. Just behind though there was plenty of drama, with Harry Hayek spinning as a result of contact with Toby Sowery. The Double R Racing man was left stranded on the exit of the corner and Douglas Motorsport's Petru Florescu had nowhere to go making contact, ending both their races on the spot. Jamie Chadwick was also involved but managed to recover to the pit lane. She was later excluded from the results for gaining outside help however. Sowery made it to Cascades but after suffering heavy damage, ended up in the gravel to end his race prematurely. With a number of cars littering the circuit the safety car was deployed, with Ismail then spinning and losing the lead to O'Keeffe, with Ahmed and Hingeley both following the South African through. Aaron Di Comberti finished in a solid 12 position gaining good experience in the series.